The filter material should keep breathing resistance at an extremely low level, minimizing much of the heat generated within the mask. RESPIRATOR protection is a broad subject that can be complicated and misunderstood by even the most experienced people. The importance of proper respiratory protection cannot be understated. This article will cover only a small segment of this vast subject. There are many types of particle filtering respirators. General categories can include: 1) Disposable particle masks. 2) Half and quarter mask respirators with a reusable filter pad. 3) Half or full facemasks with replaceable cartridges. In this article, we will discuss some of the fundamentals of respiratory protection, particles, and the most basic and the most widely used form of individual worker respirator protection: the disposable particle mask, also called the filtering face mask. Many activities in industry, the trades, and even the home involve substances against which you need to protect yourself. Very fine aerosols or respirable dusts may be released by grinding, drilling, milling, as well as painting and cleaning processes. These particles are not only a nuisance but also can be a health hazard, because they may cause respiratory tract and lung irritation, as well as diseases. In particular, diseases such as asbestosis and silicosis are generally known to the public. However, many other substances, such as metal dusts and fumes, also can be the cause of diseases. It is important to note that OSHA's decision logic requires the use of engineering controls as the first line of defense against respirator hazards. Individual respirators should only be used when the hazard(s) cannot be eliminated by engineering methods. Also note that requirements and policies of a Respiratory Protection Program will not be discussed in this article. Some fundamental information you should know about respirator protection: In order to provide proper protection users must know what contaminate(s) you are being subjected to, the level of contaminate, and the permissible exposure limits of the contaminate. You must also be trained in respirator donning/doffing and such things as the possible symptoms of overexposure. Following manufacturers' recommendations for donning respirators is very important because improper donning can cause a poor fit and subject the user to high levels of contaminants. Workers also may be required to have a medical checkup to ensure they can wear a respirator. They must be clean-shaven and have been fit tested with the appropriate respirator within the last 12 months. There are two basic methods of fit testing: qualitative (QLFT) and quantitative (QNFT). QLFT methods include Smoke, BitrexTM, Saccharin, and Isoamyl Acetate. This method can be considered a go/no-go type of test. The user must not detect any of the test media in order to pass the test. If the media are detected by taste or smell, the fit test has failed. The QNFT test method has two approved testers, the Fit Test 3000 and the Portacount. These testers are very sophisticated and provide an actual number that signifies how well the mask fits. If a test from either the QNFT or QLFT method has failed, the wearer should re-don the same mask, select a different size, or try a different brand until a successful test has been achieved. Whichever method you choose, every user that falls under a Respiratory Protection Program must be fit tested a minimum of annually. What are particles, and which activities may involve respirable and hazardous particles? Particles are the smallest solid and/or liquid parts that may result from mechanical processes such as grinding, crushing, and milling, but also from thermal processes such as combustion processes, reactions, and heating metal. Merely mixing and sweeping substances or demolition and renovation work can lead to spreading of particles in the air. 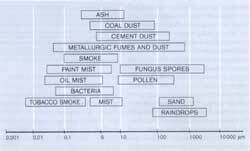 Particles with a size of less than 5 microns are referred to as respirable substances or fine dusts. Figure 1 shows different substances with their average size distribution, demonstrating where contaminants occur. Fine dusts are invisible and may penetrate the respiratory tract as far down as the alveoli. Filtering half masks must in general not be used for protection against radioactive substances, micro-organisms, and biochemically active substances. All varieties of particle filtering respirators are manufactured to fit into one of the nine categories of particle filtering media the National Institute of Safety and Health (NIOSH) has created. Three categories of the filter media being resistant to oil-based aerosols are: N--Not oil resistant, R--Oil Resistant, and P--Oil Proof. Three levels of filtering efficiency are 95 percent, 99 percent, and 99.97 percent (100). The P100 provides the greatest level of protection, and the N95 provides the lowest level (see Table 1). Filter media remove contaminates by mechanical, electrostatic, or combination mechanical and electrostatic methods. Filtering face masks are available in shapes that include preformed three dimensional, accordion flat fold, fold in half, and combinations of these designs. Folded masks that are individually packaged can be kept clean when taken to the workplace in pockets or work supply containers. Once at the workplace, a clean mask can be quickly donned. The elastic head straps should stretch to adjust to any head size without having to be tied in a knot to shorten them. The mask should provide a good fit and be comfortable to wear for long periods. The filter capacity of these masks can vary widely, which results from the fact that different manufacturers use different materials. A layered filter material should provide longer service life than a single ply material. The filter material should keep breathing resistance at an extremely low level; this will minimize much of the heat generated within the mask. Furthermore, many masks are equipped with an exhalation valve that even further reduces breathing resistance and heat buildup. Heat buildup and breathing resistance are two of the biggest objections to wearing a filtering face mask. This is important because even the best mask cannot provide protection if the user refuses to wear it. The respirator you choose must meet the safety requirements for respiratory protection, but it also should be user friendly, comfortable to wear, and easy to use.